I actually got this from the Rachael Ray show a couple of years ago. My family LOVED this more than the traditional meal. It got a 14 thumbs up…which is a rarity in this house. We try to make it every year. I suppose you could use chicken as well. I might try that this year! Open the dough. Cover your surface with a light dusting of flour and cornmeal. Cut your dough into 4 sections after it has been rolled out, my dough has perforated edges. Spread a teaspoon cranberry sauce across one section on a diagonal. This is a super job for the kids, a little messy maybe. Press your two corners together — you should have turkey mixture running down the middle with some filling exposed at each end, sometimes I do and sometimes I don’t. Lightly brush evoo on top. You can sprinkle sesame seeds at this point, I don’t usually. I used a pamper chef cooking stone and bake for 20-25 minutes, until evenly golden. She used gravy to dip hers in but you don’t need to…tastes great without it. It’s a great idea for the leftovers. Thanks for the idea. Yummy! Always needing a new recipes for turkey leftovers. Thanks so much:) Happy Thanksgiving! Wow, those sound yummy and a great idea for all those left overs! mmmmmmm…that sounds good and oh-so-easy! love good leftover ideas! Oh my soul, YUM! 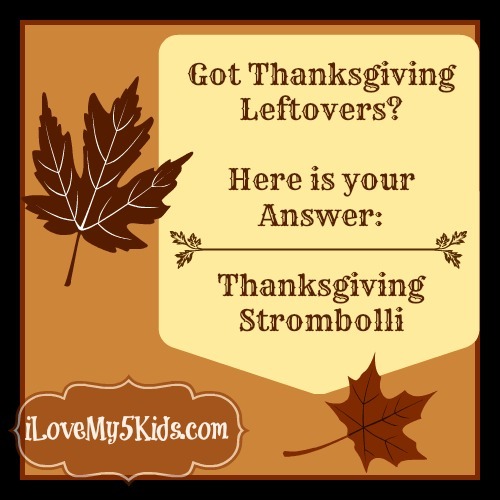 I love leftovers and Stromboli! what a perfect mix. Good idea for leftovers, I love trying to use them in different ways. Spices it up some. Hey! Thanks for stopping by. Yes, my mother is done with tats but they are addictive for me and hubby! I love this recipe and am copying it down for Friday’s lunch. I’m typically not a molded cranberry kind of girl, but I think it could really work here. Thanks so much for posting!